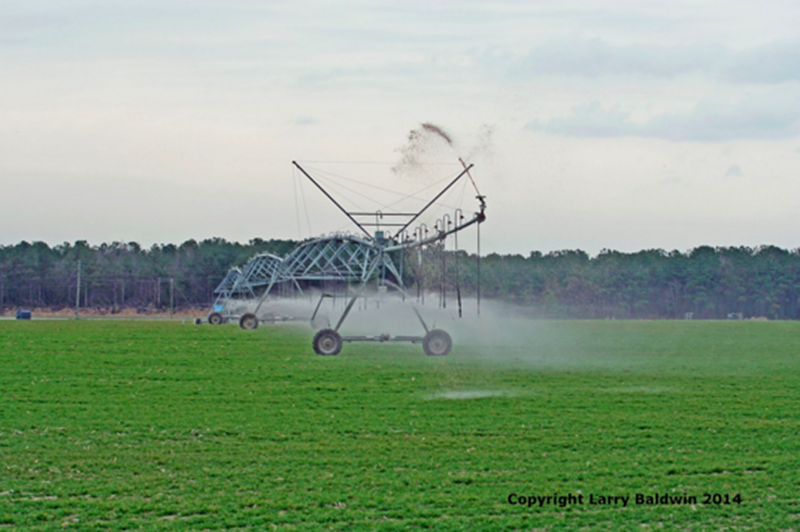 Caption: This video provides a thorough overview on the issue of CAFOs in North Carolina. View more videos like this on our Toolbox page. As the second largest pork producer in the United States, the hog industry has been and is still an integral component of North Carolina’s economy. Before the industrialization of the hog industry, most North Carolina producers raised small numbers of hogs, typically fewer than 25, on diversified farms where hogs were one of several crops or products. Over the last 3 decades, however, the industry has undergone a major shift. Though the number of producers in the state has declined, the hog population has increased substantially from about 2 million in 1982 to 10 million in 2006. This shift is the result of a system adopted by industrial producers in North Carolina, that involves raising large numbers of hogs in confinement structures that emit toxic gases and particles into the environment. These confinement structures, commonly referred to as confined animal feeding operations (CAFOs) or industrial farming operations (IFOs), are predominantly concentrated in low-income communities and communities of color of the state’s Eastern Coastal plain, where corporations are lured by pro-business tax incentives, lax environmental regulations, minimal oversight, and encounter little push back from community residents. This low-lying region, which has sandy soils and shallow aquifers and is vulnerable to flooding, now has the top 10 ranked counties for numbers of hogs per land area in the entire United States. The defining characteristic of a confinement operation is the concentration and maintenance of animals in a designated area for 45 or more days of the year. This method allows growers to produce more animals using less space, making it increasingly lucrative for hog producers. But the concentration of animals necessarily results in the concentration of their waste. While smaller diversified farms have traditionally and sustainably used animal waste as crop fertilizer, large-scale CAFOs produce high concentrations of massive amounts of waste. In short, CAFOs produce too much waste for too small a space. 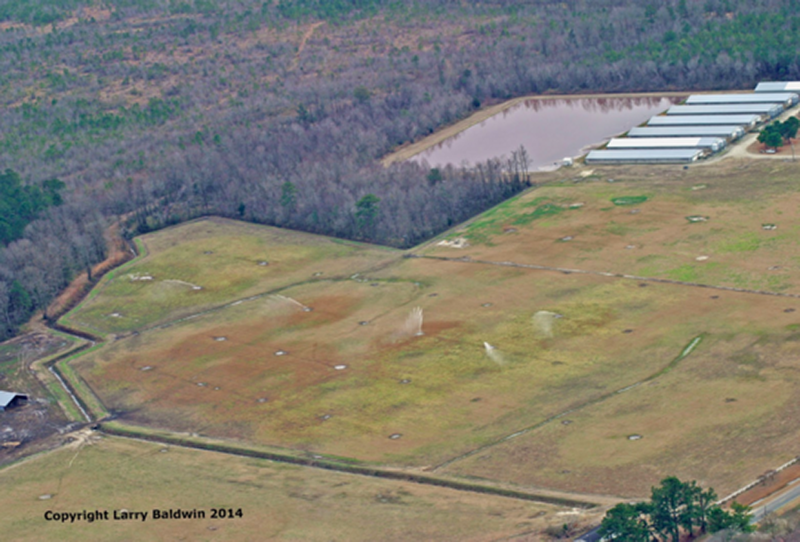 As a result, hog waste is stored in large pits referred to as lagoons and later sprayed on neighboring fields. The pervasive odor and airborne irritants produced by these practices causes serious problems for neighbors of confinement operations. Both the sheds and the practice of spraying concentrated waste release hazardous gases into the general environment, polluting the air, spreading odor, and causing respiratory illness. When hog waste is stored in lagoons, it leaches into the groundwater, contaminating the local water supply with nitrates, disease-causing bacteria, and hormones and antibiotics from fortified feed. This is a particular concern in communities who use private wells to supply their water. Additionally, runoff from confinement facilities adds excessive amounts of ammonium, nitrates, and phosphorus to downstream bodies of water, producing algae blooms and depleting oxygen. Overflow is also a concern, particularly in the low-lying and hurricane-prone counties of southeastern North Carolina. These concerns became a reality in 1995 when an 8 acre lagoon in Onslow County ruptured, spilling 22 million gallons of untreated waste into the New River. Other spills followed later that summer and in 1999, torrential rains from Hurricane Floyd caused a number of lagoons to overflow, creating a 350-mile dead zone awash with thousands of dead hogs and 25 million gallons of their waste. Living near CAFOs affects mental as well as physical health. Neighbors to confinement operations have reported greater depression and anxiety, sleep disorders, and higher stress levels. Schiffman, et al (1995); Schiffman, et al (2000); Horton, et al (2004). These health concerns are an even greater problem because these hazardous waste management practices are poorly regulated. CAFOs are defined generally according to federal rules by the EPA. Individual state departments determine the process of applying for permits and approve applications. In North Carolina, that responsibility falls to the state Department of Environmental Quality (NCDEQ). While the disastrous spills in the 1990s prompted stricter regulations, many of the state rules are still vaguely defined and full of loopholes. Furthermore, the CAFO industry is self-regulating and self-reporting. It is the confinement operator’s responsibility to report damaged or deteriorated equipment, spillages, and leaks and to record when the lagoon is stocked and when waste is applied to land. This process leads to notoriously poor enforcement of the environmental protections that are in place. Conditions that make communities such appealing sites for confinement operators – tax incentives lax regulation, and historically little pushback – make CAFO communities target hosts for other unwanted land uses, including landfills, industrial processing facilities, and hazardous waste sites. 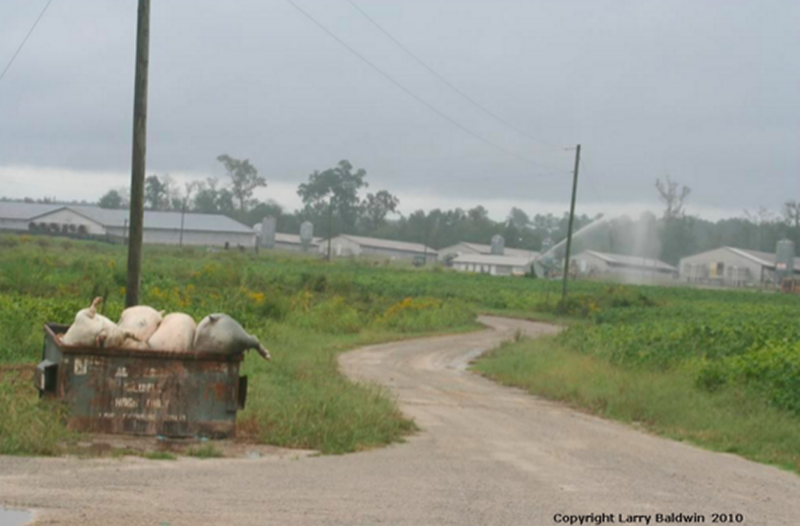 Thus, many CAFO communities in North Carolina bear a double or triple burden of detrimental impacts. Far from powerless as the corporate hog industry so often assumes, communities have fought back, establishing formal groups, creating dialogue, holding rallies, and taking legal action. Despite communities’ past victories and on-going efforts there is still so much to be done! Lasting change takes time and support from everyone, including you! Here’s how you can help.